Confession time…I am the queen of shortcuts. I’m constantly trying to figure out how I can do things ahead of time, do them quicker and more efficiently. I test multiple methods out for whatever I’m doing. Maybe half the time, my method works the first time. The other half, well, I basically learn from my mistakes. 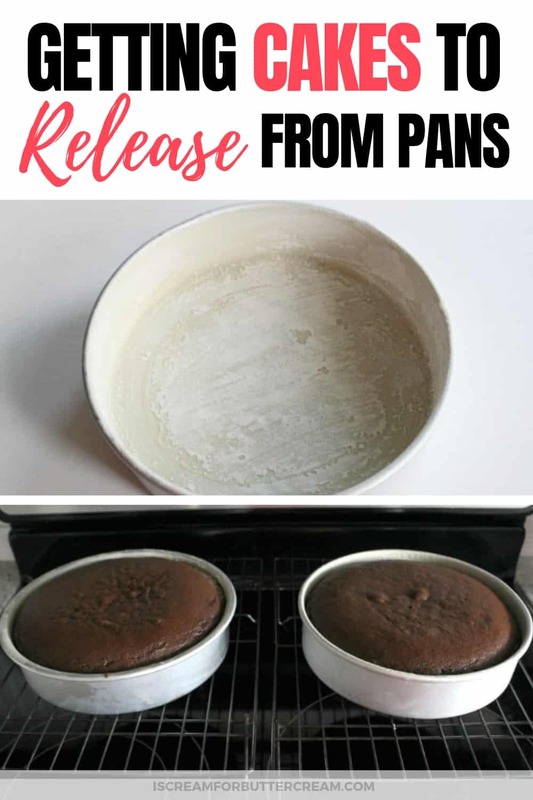 These tips for getting your cakes to release from their pans are basically tips I learned from screwing up. The number one lesson I’ve learned is that this is a step you can’t skip and shortcuts just don’t work. I thought I’d share my tips with you, so you don’t have to mess with guessing what will work and what won’t work. First I WILL say that in my experience, different cakes call for different methods. 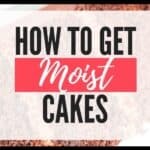 The more moist and tender a cake is, the more it will tend to stick to the pan. For me, chocolate cake LOVES to stick in pans, so I have to do a little more preparation on them. I’ve broken my tips out into two different methods. If you are unsure, it’s better to go ahead and do the second step…it doesn’t hurt anything. So, on to the tips! You’ve probably heard about the cake release recipe. You mix equal parts, vegetable oil, shortening and flour and coat your pans with it. (The recipe is at the end of this post.) You can then store it in a sealed container and use it for later. It’s shelf stable. This stuff isn’t all hype…it really works. I’ve never had it fail on me. Mix your cake release recipe well. It’s gonna be messy. Each time you use it, you’ll have to mix it a bit. I’ve tried mixing it by hand and with a mixer and honestly I haven’t noticed a huge difference. It will work either way. Now, some people will use a pastry brush to brush it onto the pans. I normally don’t do that because for some reason, I can’t get pastry brushes that don’t shed. Every time I’ve tried it, little bristles come off the brush and stick to the pan. Gross! What I do is get a little paper towel and load it up with the pan release and then rub it onto the pan. You want to coat it well. For most vanilla cakes, I’ve found that’s all I need. You usually don’t need to sprinkle any flour on the pans. The exception to that would be my Favorite Vanilla Bean Cake. It’s really moist and tender and I’ve found it helps to also coat the pan with flour to get it to release really well. Alternatively, you can spray your pans with PAM cooking spray or the Baker’s Joy spray that has flour in it. If you go this route, I can’t guarantee it’ll work on every cake. It’s kind of been hit or miss with me, but I have found if I spray it VERY well, there’s a better chance my cakes might release. When I use the pan release recipe though, I don’t have to worry…I know it’ll work. I’ve found that chocolate cakes (or cakes made with oil instead of butter) are a whole different ball game. I have a theory that it’s because they just tend to be a bit more moist and tender than the average vanilla cake, since they’re usually made with oil. Regardless, I change things up a bit. I take my pan release mixture and rub a good amount on the cake pans. Don’t be stingy with it. I then take flour and sprinkle into each pan and then tap it around to coat the bottom and sides. Don’t forget the sides! This method has worked great for me. Just about every single time I’ve forgotten to sprinkle the pans with flour, I’ve had problems with sections of the chocolate cake sticking to the pan. Also, I’ve never gotten the cooking spray, either PAM or Baker’s Joy, to do the same job for chocolate cake. 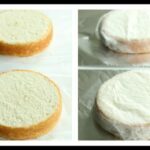 These steps are important for getting your cakes to release. 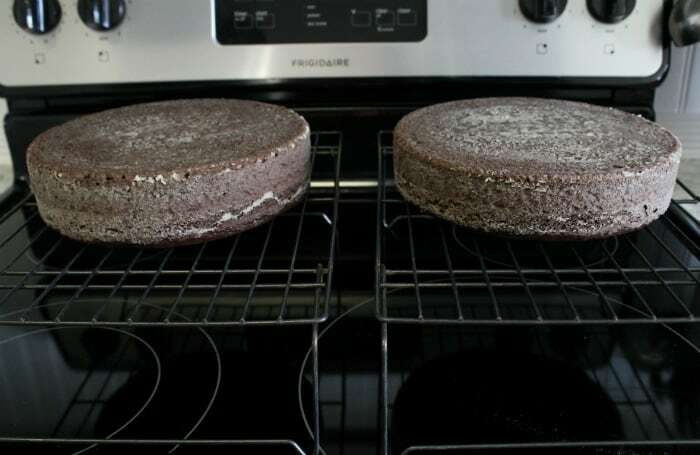 After you take your cakes out of the oven, let them cool on wire racks for ten minutes. JUST TEN MINUTES! Ok, I’m sorry I yelled at you, but I needed to get your attention 😉 If you’ve got larger pans or perhaps a bundt cake, you might want to let it sit on the racks like this for about fifteen minutes…but don’t forget about it. Now, once you let them sit for the recommended amount of time, take the cake pan and set it directly on your stove or counter. Take the rack and turn it face down on top of the cake. Now grab the whole thing and flip it over in one quick motion. Your cake will be sitting upside down on your rack. Just grab the pan and lift up and off your cake. 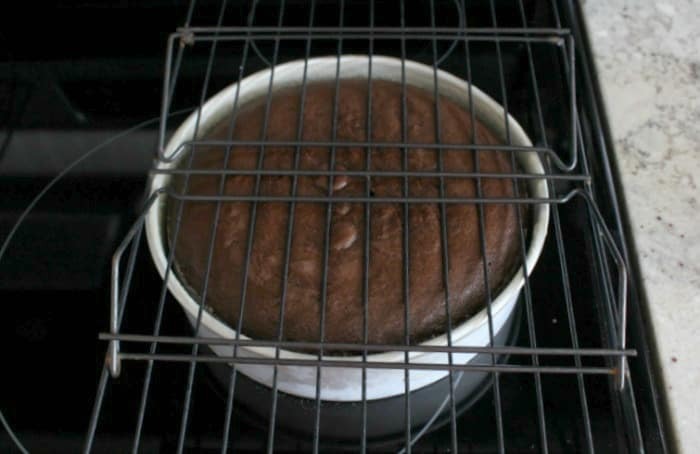 You can find my Easy Double Chocolate Sour Cream cake recipe (pictured above) here. 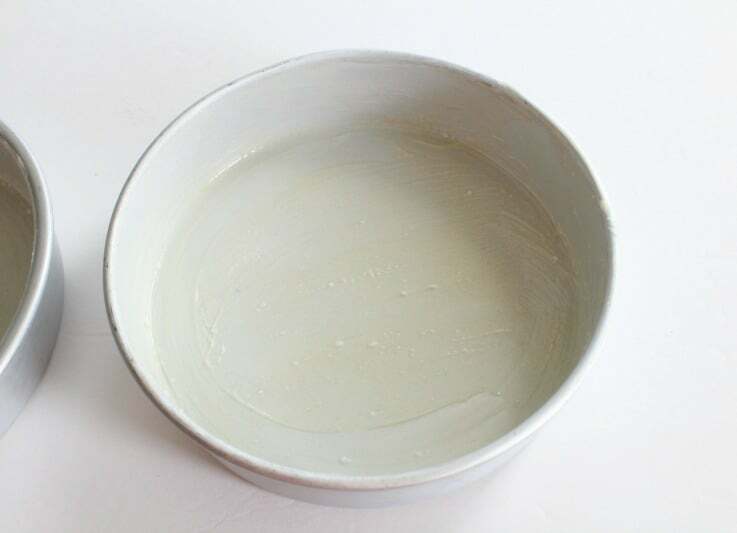 Use this mixture to coat your cake pans. They'll release like a charm. If you're making a chocolate cake, a very tender cake, or a cake made with oil, it helps to also coat it with flour after you've coated it with the pan release. 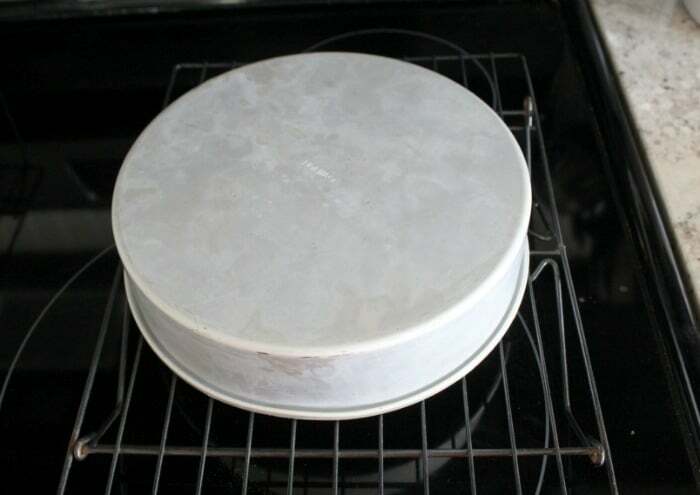 Coat the bottom and sides of the cake pans well with the pan release using either a paper towel or a pastry brush. If you're making a vanilla cake, you can go ahead and pour your batter into the pans. 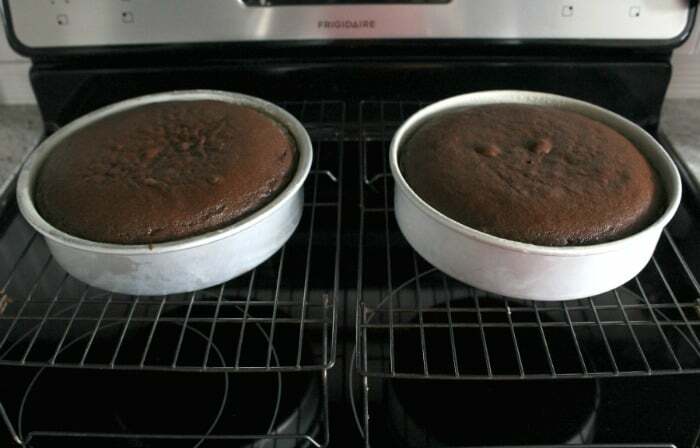 If you're making a chocolate cake, after you've coated the pans with cake release, sprinkle the pans with flour and then tap them to coat the bottom and sides of the pans, then pour in your chocolate cake batter. DON’T FORGET TO PIN IT BELOW! I use cocoa powder to dust pans instead of flour on my choc cakes (and brownies). Just to get rid of the ghostly look of flour on my layers! That has worked so far, any reason it shouldn’t? I’ve seen people do that before, but I’ve never actually tried it. I think it’s an awesome idea though. Looks better than the ‘ghost look’…you’re right about that. I think as long as it’s working for you, I’d keep doing it! Hmmm, I’m not exactly sure why they would come out hard. You mixed equal amounts of shortening, vegetable oil and flour right? I can’t figure out why the outsides would crisp up like that. Next time, you might try dusting the pans with a bit of flour after you coat them in the pan release. I’m not sure if that would help or not. 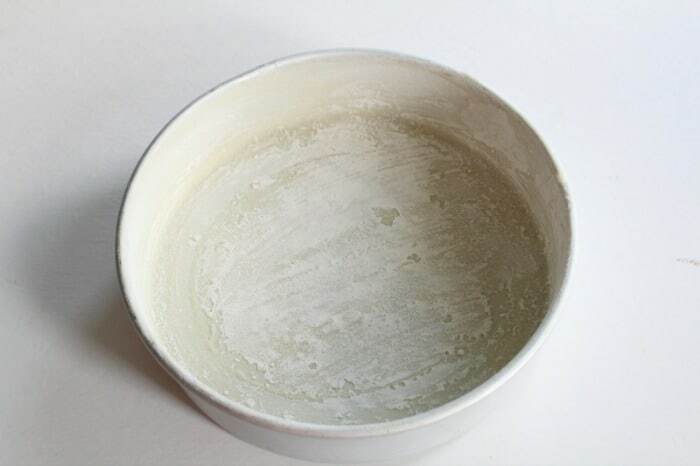 I’m wondering if too much pan release was spread around the pan though, maybe it could have caused it. Let me know if it does it again. I’m curious. Yeah I know what you mean about Bakers Joy. Sometimes it works, but sometimes not. You must have some really moist loaf cakes if they’re still sticking in the pan like that. They sound amazing! It does sound like you’ve tried everything though. I have a couple suggestions: You could try using a bit more shortening and really flour that pan, or use the cake release recipe and then flour on top of that. Another thing you could do is just line your pans with parchment paper. Cut out a strip for the longest part and then another wide one to go across the other way. (Hope that made sense.) I think at this point if the shortening and flour isn’t doing it for you, you may just have to go with parchment paper, or look at purchasing different loaf pans to see if that helps. How do I store the cake release mixture? If you said it above and I missed it, I apologize. Thank you for the tips! Hi, great post – lots of helpful tips. I was wondering why you don’t just use baking paper? Baking paper works as well, but I’ve just never really got into the habit of using it. I just don’t like messing with it. It seems easier to me to just use shortening and flour or the pan release but that’s just my preference. Genius, this worked perfectly – before reading this, my cake came out as crumbs, after the cake practically jumped out by itself! Thank You!